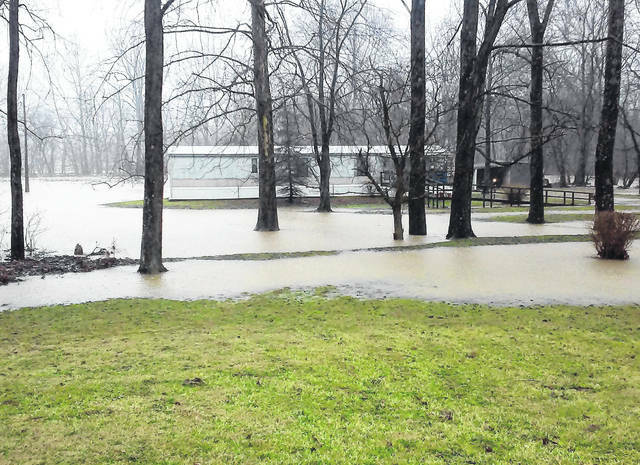 Flood watches have expired except for those communities along the Ohio River, but water from the swollen Rocky Fork Creek is seen here Tuesday afternoon encroaching upon a mobile home on Fettro Road just off SR 124 east of Hillsboro. The flood watch, which expired at 5 p.m. Tuesday, was replaced with a high wind advisory through 7 a.m. Wednesday. According to the Ohio Departmentof Transportation District 9, the following roads in neighboring counties were closed Tuesday afternoon: SR 124 between Beavers Ridge Road) and SR 772 at Idaho in Pike County; SR 220 at River Road and the CSX Railroad, two miles south of Waverly, in Pike County; SR 104 at the Deer Creek Bridge, between Williamsport Pike and Pennyroyal Road, in Ross County; SR 73 at the Second Street Bridge and the city of Portsmouth in Scioto County; SR 73 at the U.S. 52/SR 852 overpasses, west of Portsmouth, in Scioto County; and SR 239 between U.S. 52 and SR 73 at West Portsmouth in Scioto County.